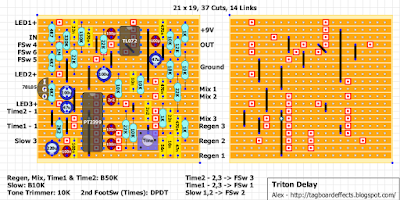 Here is a layout for Culturejam's Triton Delay. You can find his Build Guide here (Log In needed) and extra info on Madbean's website. "The Triton Delay is yet another PT2399-­‐‑based delay circuit that, at its tonal and topological core, is substantially similar to the Rebote 2.5 by Tonepad. TheTriton, however, diverges from the base concept by adding a second Delay Time potentiometer and a unique (in the DIY world) modulation effect. The Delay pots are selectable via footswitch (latching), and when switching from one time setting to the other, the delay time change happens slowly, just as if you were manually turning the delay time pot on a standard delay pedal. This causes a gradual pitchbend that slowly resolves to unison if a note or chord is struck and held when toggling between Delay pots. To control the speed of the pitch bend/resolve, there is a pot labelled “Slow”. Making the transition speed slower also makes overall delay time longer. It’s a very interactive system." Nice sounds! Cheers Alex. The link to the build guide doesn't seem to be working for me. It should ask you to Open or Save. Nope. You'll need to be logged in to Madbean forum for the link to work - so it doesn't work for most. Hmm. The link is still unavaible for 99.9%. I think it should be mentioned that one needs to log in to madbean forums to see it. Or remove the link completely. Otherwise it's just a dead link. I for one would be interested to see a short description what the second footswitch does and what are the changes compared to all the other PT2399 delays out there. But i'm not going to create user account to Brian's forum, as i'm already active on way too many sites. Thanks for the kind words, Travis! This is... really nice. Thank-you for another great layout. Thank you for a great layout once again. I will built it but I have 2 question on the led. If i understood correctly 1 Led is for bypass and the 2 other are for time 1 and time 2. I don't understand who is who in Led 1, 2 and 3. On the board it's the positive side of the Led, the negative side is on the ground we want and not on the footswitch as usual for time 1 and 2 Leds? LED3 is the bypass LED. LEDs 1 & 2 cathodes (negative sides) are directly connected to ground. No switch involved. You could connect the cathode on LEDs 1&2 to the ground on switch so they turn off in bypass right? Wait, I see that they are not rate LEDs, nvm. Thank you. Now I know where I am. You can tag it as verified. It works very well and the tone pot (not only) is very nice. Here is some pics of my build, I put the tone pot outside and add the multiplex daughter board. this looks awesome. what size enclosure is this? to add the mod, I assume you used the "switchable boost" set up on the offboard wiring page but added the mod after the main effect. what's the advantage of doing that over the "dual effect example"? Thomas, the pictures of your build are no longer online, but if I remember correctly, you've added a "Speed" pot, which I guess sets the speed of the transition between Time 1 and Time 2. Could you tell me what you did on the circuit board in order to do that ? I would like the transition on my build to be slower, if possible, so I'm really interested in your mod. I've just finished this and I love it! It's a great sounding delay and I also brought the tone pot outside and I like being able to tweak it. In the original build document they recommend a 100u capacitor in parallel on a switch which I've added and it makes the transition longer. This is useful when there isn't a huge difference in the two delay times (ie going from that piled on ring-modish sound to a slapback) to create a long enough transition and for flipping backwards and forwards during a longer time-difference transition. A couple of questions if that's OK. The difference in the mix seems fairly slight. At full left there is no mix, just dry signal and there is a difference by the time you get to full right but it's subtle, Should the mix work like this? Secondly. My Time 1 and 2 pots are wired backwards. I'm more than willing to accept responsibility for this but I've checked it over with the layout and it seems wired correctly but there is still a high liklihood that it's my error. Thanks again for another great layout! I just finished my Triton. I've been on a Futurama thing lately, this one's a bit of a mash up. I build this vero several times now (at first for myself, gave it away, again for myself.. and gave it away...) So I know its verified and working. But I'm building another one (for myself :) and this time I doesn't work as supposed too, but I can not find the fault. The 'Normal' sound is quite loud in the Mix. Actually quite distorted. The delay very low. Even when the Mix is turned fully clockwise, the original signal stays there. While that should not be the case; Only the delayed sound should be there. The tone knob doesnt too much in this build as well. But maybe that has to do something with the previous problem. Does anyone gets infinite repeats?? Hey, my clean signal is distorted too much. Any ideas how to fix that? (See also previous post) Hope someone can help me out! To describe it better. The 'ON' signal is way louder than the bypassed signal. Causing distortion. Hi! correct me if i'm wrong but pot "slow" must be really useless in that pedal 'cuz it changing length of both delays equally. So it is not necessary at all to add that pot.